Image, created using data from the NOAA-NASA Suomi NPP satellite, showing how lights across San Francisco Bay Area shine more brightly in December than they do during the rest of the year. SAN FRANCISCO — Cities around the world brighten considerably during the holiday season, surprising new images from space reveal. City lights across the United States blaze 20 to 50 percent more brightly in December than they do the rest of the year, and some cities in the Middle East brighten by more than 50 percent during the Muslim holy month of Ramadan, researchers said. 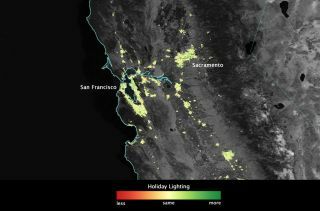 A look at how city lights shine brighter during the holidays in the United States, as shown using a new analysis of data gathered by the NASA-NOAA Suomi NPP satellite. Dark green pixels are areas where lights are at least 50 percent brighter during December. "People are leaving work for the holiday, and they're turning on the lights," he said, adding that scientists had previously thought that nighttime lights were relatively stable throughout the year. "People are demanding more energy services, and we see that embedded in this data." Roman and his colleagues analyzed data collected in 2012 and 2013 by the Visible Infrared Imaging Radiometer Suite (VIIRS) instrument aboard the Suomi NPP (National Polar-orbiting Partnership) satellite, a joint mission involving NASA and the U.S. National Oceanic and Atmospheric Administration. The researchers developed a new algorithm that filtered out clouds and moonlight in the VIIRS data, allowing them to isolate city lights and track how they changed over time. Snow was too reflective for the algorithm to handle, however, so the team looked at 70 warm American cities, all south of St. Louis. Every one of the 70 (as well as cities and towns throughout Puerto Rico, an unincorporated territory of the United States) lit up just after Thanksgiving and blazed brightly through Jan. 1, Roman said. Image showing how Los Angeles, Las Vegas, San Diego and Phoenix shine more brightly during December. Scientists used data from the NASA-NOAA Suomi NPP satellite to create this view. "This is telling us something that we all as Americans know, which is that Christmas is not just a religious holiday; it is also a civic holiday," he said. "This space-based retrieval is tracking this national tradition. It's amazing." The same pattern was also observed throughout the Middle East — but the holiday of note in this region is Ramadan, the ninth month in the Islamic calendar. Many Muslims fast during the daylight hours throughout Ramadan, delaying meals and a number of other activities until nightfall. Cities in Muslim countries such as Jordan and Egypt exhibited the brightness spike during Ramadan while the lights in neighboring Israel remained stable throughout the year, showing that the VIIRS data can track cultural differences, researchers said. City lights brighten in several cities in North Africa and the MIddle East during the Muslim holy month of Ramadan, as shown by an analysis using data from the NASA-NOAA Suomi NPP satellite. Dark green pixels are areas where the lights are at least 50 percent brighter during Ramadan. The effects of geopolitical conflicts can also be observed. For example, the satellite data revealed a 94 percent drop in the nighttime brightness of the Syrian city of Aleppo just after a major battle began there on July 19, 2012, during the country's ongoing civil war. "These nighttime lights really are in some ways the EKG of a city," said study co-leader Eleanor Stokes, a Ph.D. candidate at Yale University. The new results — and the approach developed by the research team — could help scientists better understand energy demand, which in turn may lead to better climate change mitigation strategies down the road, Stokes added. "What we found here is that energy service demand is the aggregate of human activity, and human activity is driven not just by individual factors like price — like energy and electricity prices — but also, activity is driven by social and cultural context," she said. "When you look at the energy signatures, you can see those imprints, those cultural and social imprints."